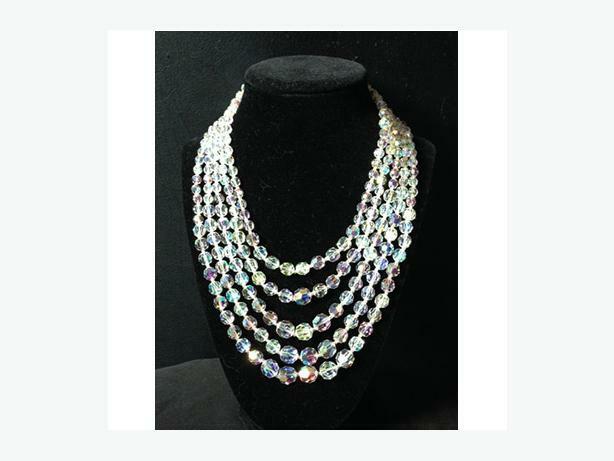 Vintage five strand aurora borealis (rainbow) cut crystal necklace. From the 1950's. This stunning five-strand necklace of faceted aurora borealis cut crystal beads sparkles through the colours of the rainbow as the light catches each of the beads at different angles. The piece has a shepherd's hook closure and an additional 3 inch long (7.5 cm) silver tone metal extender. The shortest strand measures 12½ inches (32 cm) in length; each of the other strands is slightly longer and the longest strand measures 18 inches (46 cm) in length. The necklace drapes nicely when worn and is in excellent used condition.